Delta has dropped the price of a few of their 1 stop flights from Toronto to Honolulu, Hawaii down to $444 CAD roundtrip including taxes. The flights have 1 stop each way in Minneapolis, Atlanta, or Salt Lake City. 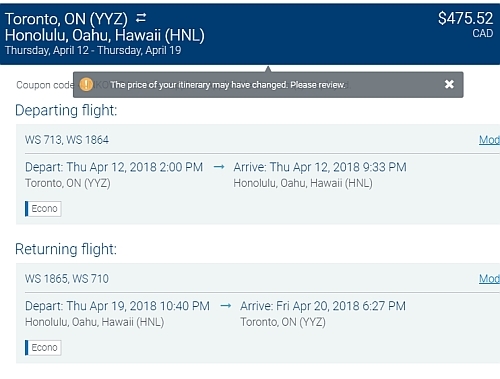 There's also a few 1 stop WestJet flights from Toronto to Honolulu in April and June for $474 CAD roundtrip. The Duration of the flights should be 15 hours on the way there, and 13 hours on the way home. They may not always be the top search result on the Flight Centre website. Update 12/27 - There are now a lot more dates available for $444 CAD roundtrip including taxes as United Airlines / Air Canada have dropped the price of their flights from Toronto to Honolulu on many dates between January and May 2018. NOTE: I've noticed a few things when trying to book this through Flight Centre. Sometimes the flight price appears to be more expensive on the search result page. But after you select the outbound flight, the flights will drop down in price. In other cases, I've seen the Flight Centre search engine not be able to find and verify the price. It can be worth trying slightly different dates, or even trying different flights on the same dates. 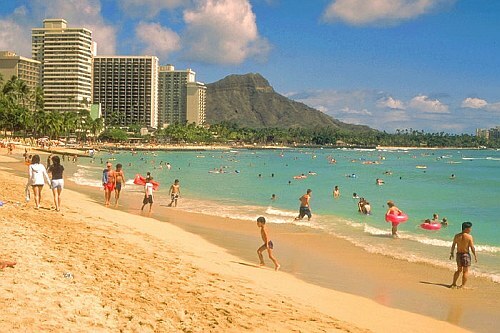 toronto, yyz, flight deals, united states, delta, honolulu, hawaii, hnl and north america.